"I am not eccentric. It's just that I am more alive than most people. I am an unpopular electric eel set in a pond of catfish." I can be "mainstream" ("normal" would be a misuse of the word in this instance), or I can be eccentric. It depends really on which hat I'm donning. No, that didn't sound right. Let me rephrase that. I can be "mainstream,” or I can be eccentric. It depends really on whether I choose to don my "mainstream" hat. I don't need an "eccentric" hat; I am by nature eccentric - or at least that's what I've been told, both by implication as well as expressly. 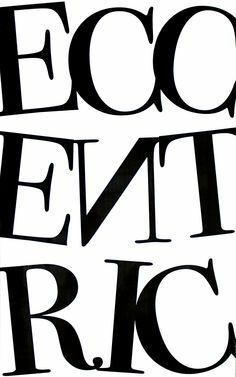 But what exactly does "eccentric" mean? Well, Googling the word gave me this: "Unconventional and slightly strange.” Slightly strange? Does this mean that being eccentric is a bad thing? While I don't have the answer to that, what I do know is that we're mass-produced to not accept ourselves - or others - for our individual and quirky ways. We're all programmed by societal factors and influence to fear being different, so much so that eccentricity is considered taboo in certain quarters. In short, we're all expected to be, well, mainstream. I used to carry this fear (like you, I too was so programmed), but not any more. These days, I tend to turn a deaf ear to the things people say about me. And to be honest, I couldn’t care less about them. So I'm different... is that "wrong"? After all, it's not as if I'm psychotic or anything; I'm just more.... alive, as Dame Sitwell so aptly put it. Unlike most, I seek not to stay bumbling around in the overcrowded comfort zone - I was there almost my entire life! I now much prefer the fresher air outside.... I need it, even if this sometimes puts me in the pillory. But bloody hell - pillory or not - I'd much rather be "slightly strange" than deathly boring! Indeed, the fact that I've learnt to not fear being different makes me feel more empowered. It's something that comes from within and is hard to describe. It's like I don't have to copy social trends or rely on others' approval in the things that I do anymore. It's a feeling I can only describe as "liberating.” Know what I mean? But that doesn't mean I lack social etiquette, which is a different thing altogether. I mean, you can't really compare the two, can you? But in case you're wondering.... yes, I do have good social etiquette - an abundance of it, in fact. Being different merely means that I've gone that extra refining mile to stand firm against all that negative barrage from those whom I consider "dulled, deadened and zombied" by conventional standards. Which in a way makes me kinda stand out, don't you think?